Free Printable Halloween Worksheet. Free Printable Halloween Worksheet that can be a fun educational activity. You can use this free printable Halloween worksheet for a special Halloween themed activity at school. Your students can use imagination coloring with their favorite color. They can also practice writing skills with the words “Happy Halloween”. Then they can display all the Halloween worksheets at the classroom where parents can see their great job. Print this Halloween Worksheet free using your home or office laser or inkjet printer and share with students. 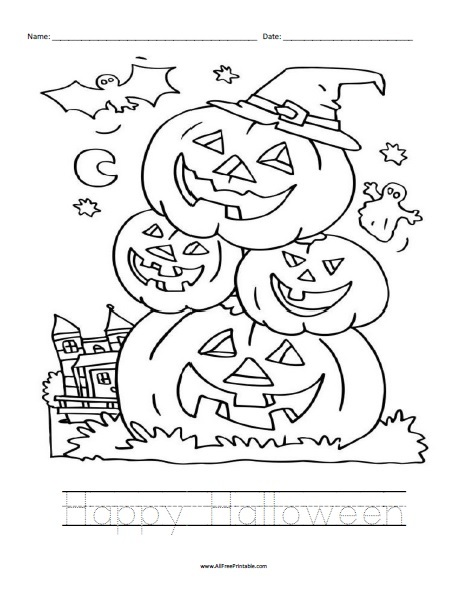 Kids can have fun coloring the bats, pumpkins and ghost, and also writing with this worksheet. Click the link to download or print the Halloween Worksheet free in PDF format.